This JGA-104 high speed spot coating machine (UV luster machine) is mainly used for the coating and lutering all kind of thick and thin paperboard and sheet. It also can be used as local glazing machine. The highly automatically electrical design leads to high efficiency. 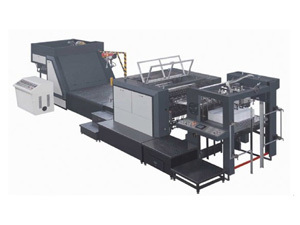 There is imported UV dry system used for this machine to dry the printed matters completely, and an energy-saving dim-out setting is available to save operating cost for it. Otherwise, the specially designed fold diameter impression cylinder can efficiently reduce press effect, caused by surface tension of the lustering oil. And also it can decreases orange peel, improve brightness of the printed matters for the adoption of the cylinder. 1. There is automatic high-speed sheet feeding machine for feeding, ensure stable and reliable sheet feeding. 2. There is also well-designed front guide, pulling guide and swing-down sheet transfer mechanism. 3. The swing-down sheet transfer mechanism of this equipment can shake foreign materials out on the surface of printed matter, which in turns leading to luster surface bight and smooth. 4. Swing control of sheet transfer with conjugate cam reduces vibration noise and makes working environment silent. 5. The specially designed fold diameter impression cylinder can efficiently reduces press effect decreasing orange peel, improving brightness of the printed matters. 6. There is high accuracy reticulate pattern roller for oil supply, which leads can control oil mass effectively and lustering oil uniformly distributed. 7. There are also quick exchange device of anilox roller, which can exchange anilox roller with different lines as different glazing requirements in time. 8. For the collection section, there is low noise guide rail for sheet collection that makes the sheet collected smoothly. 10. The cylinder gears of this spot coating machine (UV luster machine) are made of high strength alloy, with robust structure and stable accuracy. 11. In the mean while, there are steady frame and base to ensure a long turning without vibration. Founded in 2009, Shanghai Pripack Machinery Co., Ltd. has continually focused on providing a wide variety of paper processing, printing and packaging machinery for customers around the world. We are very familiar with international market of paper cutter, printing machine, flexographic printer and its trend of development. With products of high quality assurance and CE certificated, we are sure to provide our customers with the best products at competitive price.